When was the last time you had a really good dinner roll? One with a golden crust and a pillowy, yeasty interior? With enough butter-kissed flavor that piling more butter on at table is an indulgence, not a necessity? If you buy dinner rolls at the supermarket, it’s probably been a long time since you’ve had one that’s really worth eating. Fortunately, however, making your own is quite easy. And although it takes a while for the dough to rise, your hands-on time is only a few minutes. So for your next dinner party or holiday meal (these are a natural at Easter), why not surprise your guests with a basket of fresh, homemade dinner rolls? They’ll disappear in a hurry, guaranteed. Just remind everyone to save some room for the rest of the meal. There are scores of recipes out there for soft dinner rolls. And Mrs. Kitchen Riffs (the baker in our household) seems to have tested most of them before she settled on this one. 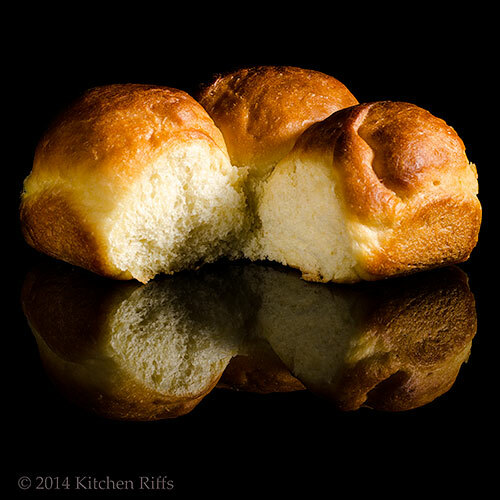 This recipe is loosely adapted from King Arthur Flour’s Big Batch Quick Dinner Rolls. Initial prep time for this recipe is about 10 minutes, with initial rising time of 1 to 2 hours. Then you’ll need another 5 minutes or so to cut the dough and form it into rolls, followed by additional rising time of 1 to 2 hours. So figure on about 2¼ to 4¼ hours total, most of it unattended. This recipe yields 24 rolls. They keep for a few days if stored in an airtight container or a food storage bag. Or you can freeze them for several weeks. We like to serve these dinner rolls with homemade butter, but store bought works almost as well. It’s hard to resist dinner rolls when they’re fresh from the oven, but their flavor actually improves if you bake them several hours ahead and allow them to rest. Convenient, no? To warm them up, just nuke the rolls in the microwave for a few seconds before serving. Or place them in a low-heat oven for 10 minutes or so. Stir in the butter and salt. Then attach the dough hook (if using a stand mixer) and add the flour. Stir the mixture with a spatula if necessary to combine the ingredients. Then knead at low speed for about 5 minutes, stopping to scrape the bottom and sides of the bowl if necessary (or knead by hand if not using a mixer). If the dough is too dry (or all the flour is not being absorbed), dribble in more warm water. If the dough is too wet to form into a manageable mass, add more flour, a teaspoon at a time. Knead the dough until it becomes smooth and springy. Transfer the dough to a buttered container (we use a 2-quart Pyrex container with measurement markings on the side so we can see how much the dough is rising). Cover the container with plastic wrap and let the dough rise in a warmish location until it doubles in volume (about 1 to 2 hours; see Notes). Butter a 9 × 13-inch baking dish. Turn the dough out onto a length of wax paper and flatten it into a rectangle measuring about 8 x 14 inches. Cut the dough into 24 pieces. Roll each piece of dough into a ball. Place the dough balls in the buttered baking dish and cover with plastic wrap. Let the dough rise until the rolls are puffy and have filled in most of the empty spaces in the dish (about 1 to 2 hours). During the last 10 minutes, preheat the oven to 400 degrees F.
Remove the plastic wrap from the baking dish. Bake the rolls uncovered for about 18 minutes, or until they are golden brown and their internal temperature reaches about 190 degrees F (see Notes). Remove the rolls from the oven and immediately brush them with the melted butter. Serve and enjoy. Make sure the water you use in isn’t too hot—yeast cells start dying at about 130 degrees F.
If you’re not familiar with instant yeast, you may assume it’s somehow inferior to active dry yeast (the other variety you’re most likely to find on your grocer’s shelves). In fact, however, instant yeast tends to be preferable, at least in our experience. Both forms of yeast are produced in quantity by industrial processes, so neither one is “natural.” But instant yeast is air dried (unlike active dry yeast, which is dried in ovens), so more yeast cells survive the production process. Active dry yeast needs to be rehydrated before use, while instant yeast does not—it can simply be mixed with other ingredients. So if you’re using instant yeast, you can skip Step 1 of this recipe and just combine the water, yeast, and sugar with the other ingredients in Step 2. We specify Step 1 because we store our instant yeast in the freezer. When frozen, yeast cells go into suspended animation, so we like to let them wake up and stretch a bit in warm water while we’re getting the other ingredients together. In truth, though, our instant yeast works fine right out of the deep freeze. In addition to instant and active dry yeast, you may see fresh compressed or “cake” yeast for sale (though few markets in the US carry it these days because it’s highly perishable). If you use compressed yeast in this recipe, double the quantity to 2 tablespoons. We buy instant yeast in one-pound containers, then store it in the freezer in a sealed glass container. It keeps well for at least a year, if not longer. And it’s a lot cheaper than those little packets. We’re partial to the SAF brand of instant yeast, but other brands should work fine too. Many recipes for dinner rolls call for adding mashed potatoes or instant potato flakes to the dough mixture. Potato starch provides extra food for the yeast, and is supposed to make the dough more moist and tender. We’ve tried this several times and have not been pleased with the results—the finished product always tastes slightly “off” to us. But this idea has been around for a long time, and some bakers swear by it. So feel free to add potato in some form if that appeals to you. Many recipes also use milk instead of water. This makes for a slightly richer roll, but the texture isn’t quite as good, in our opinion (you may disagree). BTW, adding egg to dinner rolls provides some nice color, but little to nothing in the way of flavor. We say don’t bother. Dough rising times are approximate—your timing may vary depending on temperature (and how lively your yeast happens to be feeling). You can mix the dough for these dinner rolls ahead of time and then refrigerate or freeze it until ready to use. If you store the dough in the fridge, it will continue to rise, though more slowly than at room temperature. If you plan to freeze the dough, wrap it tightly in plastic and then place it in an airtight freezer bag. If you refrigerate the dough after forming it into rolls and placing them in the baking dish (Step 5), you can allow the rolls to rise in the fridge for several hours, then bake them right before you’re ready to serve. We use an instant-read thermometer to measure the internal temperature of the rolls in Step 6. These dinner rolls are similar to Parker House rolls (but better, we think). Parker House recipes often call for milk instead of water, and usually include some egg. 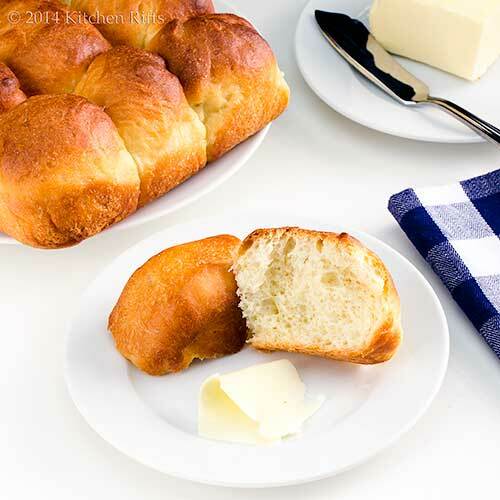 When you make classic Parker House rolls, you don’t form the dough into balls, as we do in Step 4. Instead, you cut the flattened dough into circles, dip the circles in melted butter, and then fold each circle in half before placing them in the baking dish. “The word usage seems to vary by country,” I said. Well, whatever. I just roll with it. Hi Arthur, these really are! These days we always have some of these in the freezer. ;-) Thanks for the comment. Oh my gosh!! These rolls are so much like my Mom made when I was a little girl....MANY years ago! I believe she used warm milk instead of water; Would that make a difference? I am going to make these soon...and then for Easter dinner. Thank you for this lovely recipe! Hi Dolly, warm milk definitely works -- we've made them that way, and the results are good. We just prefer it with water instead. Enjoy! Thanks for the comment. Alanna ~ We are cut from the same cloth, John & Mrs KR! Love that you’ve taken the time / energy to notice the difference in taste/texture with milk and water. Just checked my mom’s recipe, she used dry milk powder and water. There is nothing better than homemade dinner rolls (called bread rolls here) and slathered with homemade butter. These look wonderful, follks! Hi Minnie, the aroma tastes delish! ;-) These are so, so nice. Thanks for the comment. Hi Nee, this really is an easy recipe! These look a lot more complicated than they are. ;-) Thanks for the comment. Hi Alanna, we often substitute dry milk powder for liquid milk in baking recipes -- it works extremely well. Do like this recipe better with water, though. ;-) Thanks for the comment. Hi Maureen, I like "bread rolls!" Great term. ;-) Thanks for the comment. Hi Julia, it's really easy to pig out on these and skip dinner. Ask how I know! ;-) Thanks for the comment. I haven't had dinner rolls in forever! Soft and buttery? I'm in! Thanks for this great recipe, John! Perfect dinner rolls. I must admit to buying a lot of bread and rolls, but for Easter, I may have to whip a batch of your homemade dinner rolls! Hi Barb, ;-) This recipe is so worth making -- really easy, and so little hands-on time. Thanks for the comment. Hi Kristi, you owe it to yourself to have some homemade rolls! They're really great. Thanks for the comment. Hi LIz, you're such a great baker that I'll bet once you make these, you'll never go back to store bought. They're really easy. Thanks for the comment. Hi John, these buns of yours sound like brioche or similar... and very much like the kind of baked goods my mother would bake. Beautiful post, thank you for sharing. Pinned and shared on FB too. I need a good roll recipe and these look like very good rolls. They look so soft and pillowy, that I could sink right into them! On the other hand, I can imagine the smell of these filling the house, and imagine what an extra pat of butter will do, and then I might be on cloud nine and not on a pillow! Oh, my! I am crazy for dinner rolls...These looks so soft and buttery that I only want to eat them all. I want to try your recipe. I make almost all my own bread and rolls because bread you buy at the market has soy lecithin as an ingredient. It became easier when I planned ahead since making rolls/buns is not fast food. Love your info about yeast and eggs. I have tried a few King Arthur Flour's recipes before and the outcomes were usually more than just good! ... Fantastic! Amazing! Delicious! I see that it is another great recipe too. Hi Lizzy, these are a bit like brioche, now that you mention it (although of course not the same). These really are great -- they've become an obsession at our house! Thanks for the comment. HI Abbe, cloud nine is where you'll be after you bite into these! This is really a pretty easy recipe and so good -- really worth trying. Thanks for the comment. Hi Rocquie, Mrs KR really hit it out of the ball park with this recipe! They're wonderful. Thanks for the comment. Hi Denise, I really have to watch myself around dinner rolls, because I'm crazy for them, too, and can spoil my dinner! Thanks for the comment. Hi Madonna, I think you'd like these. They're really easy to make, and the flavor is so worth it. If you decide to make them, do let us know how you like them! Thanks for the comment. Hi Zoe, those King Arthur folks sure know their stuff. This is a really good recipe -- Fantastic! Amazing! Delicious! :D And really good. ;-) Thanks for the comment. Hi John, I love how shiny and golden these are. I'm imagining them with that homemade butter ....... oh my! 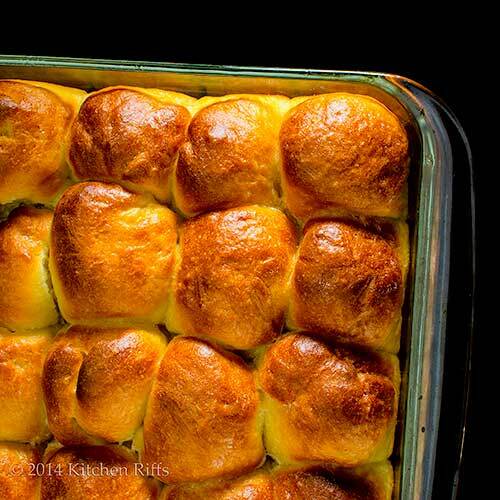 Butter-kissed dinner rolls.....love it! I could (and do) eat bread as a meal in itself; sometimes I stash baskets worth away at those restaurants where they refill your bread basket ;) I guess making rolls myself would be a more ethical way to go, though. They look so good. No matter how hard I try I can't make gluten-free bread quite as good as that. Close but it's never the same. I know that until I came to the US, I never really heard buns being called rolls. We had sausage rolls in the UK, but most if the time these bread type things were buns. I make rolls / buns quite often because I don't like the ones from the store. These look great and another one to add to my repertoire, I'll make these next time I make buns/rolls. Thanks John! Hi Lydia, it does, it does! ;-) Thanks for the comment. Hi Chris, these are wonderful with homemade butter! But they're so good, I often eat them all by themselves. ;-) Thanks for the comment. Hi Ala, these are so easy to make you'll never have to stash the bread from those baskets again. ;-) Thanks for the comment. Hi Suzanne, these really are good. And so sorry you can't eat them. But your nonglueten breads look really good to me. Thanks for the comment. Hi Bam, we usually do gobble one or two of these right out of the oven! But the flavor really is better after they cool. Your teenagers will love these! Thanks for the comment. Hi Nazneen, word usage always fascinates me! These are really worth making -- I'd be curious to hear how you think these compare to your regular recipe.Thanks for the comment. Good dinner rolls are irresistible. Add a couple of pats of excellent quality butter and a glass of wine and that is heaven. This is one of those items that I use to make with my mother. She would back a dozen at a time and when the first batch come out, we always sat down and ate half of them. :) Your pictures are busting with the scent of fresh baked dinner rolls! Simple gorgeous rolls John! Hi Alyssa, aren't they so irresistible? We don't even try (we're bad!). Thanks for the comment. Hi MJ, I don't know if these are as good as your mother's, but they're really worth making! And it's impossible not to eat at least a few when they're hot from the oven. Thanks for the comment. Oh These look terrific. I must try those to eat with Bhaji. Pav Bhaji is a Mumbai street food and the buns (rolls) used in the dish look exactly like yours do. Terrific recipe and I do have some fresh yeast sitting in the fridge waiting . Thanks John. I have a weakness for bread anything, but for some reason I've only once managed to make proper soft buns... I guess I need to try again and these look fabulous! Wow, do those ever look so fluffy and tender! Bread roll heaven! I think I could make a meal out of just a basket of those warm rolls and a crock of sweet butter. A homemade roll with homemade butter must be quite memorable. You are reading my mind man. I've just started making our own bread and among which is the Parker dinner rolls. I make those with milk and eggs as you said ... I must try your recipe. Do you have a good one for pan bread? I need a recipe for a fluffy toast. Thanks for the recipe... great pictures. Hi Ansh, bread is bread -- I'll bet these would work! I don't know the bread used for Pav Bhaji, but this recipe, with minor modifications, could easily be turned into Asian Steamed Buns! I love how universal food is. Thanks for the comment. Hi Simone, these really are easy. Which in a way is too bad -- we're making them all the time, because we're eating them all the time! Thanks for the comment. Hi Carolyn, we have made a meal of these! I don't recommend one does it too often, but they're really that good. Thanks for the comment. Hi Karen, these really are memorable! So memorable I always look forward to eating the next one. ;-) Thanks for the comment. Hi Amira, we're working on a good pan bread recipe. We've got one that's a white sandwich bread that's superb in toast, and one with a mix of whole wheat and white flour that's more Italian style (still pretty soft, though). We'll be doing both on the blog eventually, once they're perfected. ;-) Thanks for the comment. I'll be honest, I've made made these rolls, and kick myself everytime I see a food blogger that has. This looks fantastic and something I could have it every morning. Mine will be simple butter or egg. Look at those perfect golden brown dinner rolls!!! I am always in hunt for good bread recipes and I loved how this bread looks and will defintely give this try!!! This has the exact texture I am looking for in a dinner roll... perfect!!! Beautiful rolls! Perfect and extremely tempting. I love to make sandwiches with mine. Soft and buttery dinner rolls are one of the comfort foods of my childhood. The smell of yeast still takes me back. Buns or rolls, the name matters not. YUM! Hi Dawn, bread baking is pretty simple, although it's easy to be phobic about it! This is a great recipe to help people get over their fear -- it's easy, doesn't take that much hands-on time, and is pretty forgiving. Thanks for the comment. Hi Candy, we have these too many mornings! ;-) Thanks for the comment. Hi Shibi, these really are excellent rolls. And it's an easy recipe! Seems like there should be a catch, but there isn't. Thanks for the comment. Hi Rosa, aren't these nice? We like making little sandwiches out of them, too. Thanks for the comment. Hi Judy, yeast really does have such a wonderful aroma, doesn't it? Always takes me back too! Thanks for the comment. Dinner rolls are one of those super elusive recipes. Glad you found a delicious one! Hi Laura, aren't dinner rolls wonderful? We love this recipe! Thanks for the comment. Hi Rosita, these really are good stuff. So delish! Thanks for the comment. buttery brown as yours, they would also be mighty pleased. The recipe looks easy enough. I like that you can store them or freeze them. You had me at butter! Hi Carol, this really is an easy recipe -- and really worth making! Thank for the comment. Hi Charlie, that's my first thought, too, but then (at least in the US) we have hamburger buns, etc. Very confusing! And these really are dangerous -- too easy to eat these and skip dinner! Thanks for the comment. Hi Pamela, yeah, butter gets me every time, too. ;-) Thanks for the comment. I am a big fan when it comes to eating and making yeast breads. I have to say that these dinner rolls look amazing! Hi Dawn, you do a lot of baking, I know. Isn't freshly baked bread so nice? And these rolls do taste amazing! Thanks for the comment. Mmm, I love warm home-made dinner rolls with butter and jam. You dinner rolls looks fantastic, John. Hi Holly, these really are great, with or without butter/jam. But better with. ;-) Thanks for the comment. I could make a meal out of these rolls - they seriously look THAT good!!! Hi J+C, are you sure two will be enough? ;-) Thanks for the comment. Hi Greg, I can't imagine living without bread (and its cousins!) either. ;-) Thanks for the comment. Hi Ashley, it's so, so easy to make a meal out of these! We've done it before, and I'm sure will again. ;-) Thanks for the comment. Your dinner rolls look awesomely fresh and fluffy. I would love to dunk them into a creamy clam chowder or mop up my favourite curry sauce with it. I love homemade rolls, I could eat just them for dinner. These look fantastic, hope you saved a few for breakfast. ....and you would have to post these just as my oven has decided to go out. Pinned for after repair. Hi Chopin, these really are so fluffy! Great texture. ;-) Thanks for the comment. Hi Gina, we often have these for breakfast! Heck, they become the entire breakfast. ;-) Thanks for the comment. Hi Lea Ann, our oven went out a few weeks ago! Ended up getting a fancy convection one. We've had convection before, but it's been awhile -- they're definitely worth it. Thanks for the comment. I have been searching for dinner rolls recipe and yours sounds perfect. Thank you so much for sharing. Hi easyfoodsmith, this really is a great recipe -- it has tons of flavor, and it's pretty easy. Maybe too easy -- you'll be making these all the time! ;-) Thanks for the comment. wow, superbly soft and pluffy butter roll bread, looks devine!!! Hi Dedy, these really are great! Wonderful flavor, such soft texture -- good stuff! Thanks for the comment. I really appreciate you hints and notes. Since I'm not much of a baker and usually shy away from all things yeast, I know what to expect. Hi Louise, nothing is foolproof, but instant yeast almost is -- pretty hard to screw up things with it. And real dinner rolls are so worth making! You and Marion would love them. ;-) Thanks for the comment. I'd like to just have these rolls for dinner because they look that awesome! Oh, but there is nothing better than rolls like this. Pass the butter, please! Hi Pamela, they really do make a great dinner (with butter!). As I know all too well. ;-) Thanks for the comment. Hi Adri, I totally agree! This are so good. ;-) Thanks for the comment. Roll or bun, these look fabulous! What a great texture. I'd love to have these with Easter dinner. Mrs. KR makes fabulous dinner rolls! I would love to make lobster roll with these buns/rolls!! The inside looks very moist and bouncy - I love the dinner rolls that have elastic texture when I tear in half. Very very delicious, Mrs. KR!!! Homemade rolls are one of the best things ever. Yours look fluffy and delicious! Hi Lisa, these really do have great texture. We've become addicted to them! Thanks for the comment. Hi Nami, Mrs KR does good stuff, doesn't she? ;-) These are so worth making. Thanks for the comment. Hi Raymund, these combine so well with soup! Particularly chowder. Which we're having for dinner tonight. Hmmm . . . ;-) Thanks for the comment. Hi Mary Frances, don't you love a homemade roll? These really are scrumptious. Thanks for the comment. yum! love a simple bread recipe! Hi Amy, aren't these nice? Simple and tasty -- perfect! ;-) Thanks for the comment. Yesterday, I made a braided nutella bread- tasted good but the nutella 'sauce' tends to burn when baking. Maybe I should just be happy with simple dinner rolls! Whenever I go out to dinner at a fancy restaurant, I guzzle all the dinner rolls I can get- if they taste good, then I'm happy. Just get right to the rolls- forget about the rest of the food! Thanks for sharing your recipe and for the walk down Memory Lane. John, seriously man, these rolls are amazing. They put all other dinner rolls to shame. Including my own. I think these are the fluffiest looking rolls I have seen, they look so light! YUM, I can just imagine them warm. We have a family friend who makes incredible rolls like this. You can't eat just one! Hi Fran, good restaurants do tend to have good rolls, don't they? Way to easy to fill up on them! Thanks for the comment. Hi John, always nice to have food all to yourself, isn't it? Particularly something as great as these rolls! Always glad to prompt a walk down Memory Lane, and thanks for the comment. Hi Kim, aren't these great? So much flavor, and really so easy to make! Perfect. ;-) Thanks for the comment. Hi Kumar, these really are so much fun to make. Not to mention eat! ;-) Thanks for the comment. Hi Kristi, that eating just one really is a problem, isn't it? Worse than potato chips! Thanks for the comment. Hi Julie, they're irresistible when warm. Or any other time. ;-) Thanks for the comment. Hi John, I wrote a comment the other day with a question but I guess I must not have published it correctly so I'm back. I have tried roll made with potato and I like them. I don't know if they were the best hat I've ever had but they were very good. 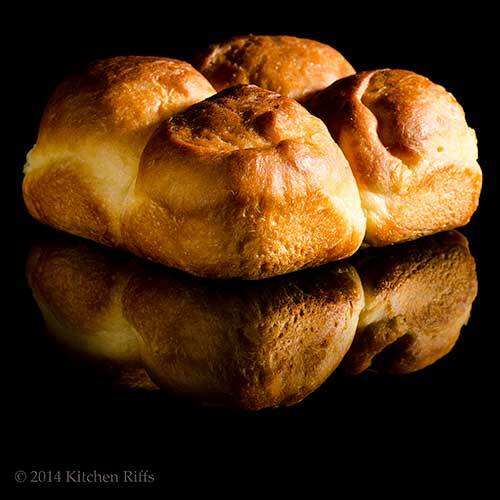 Your Mrs. Riff's rolls look very enticing! Your photography skills don't hurt them any either. I was wondering how you set up the shot. Did you use a black background board and another one on the counter with a piece of glass over it? —love love love the picture! Hi Mireya, sorry your earlier comment disappeared -- that happens sometimes with Blogger, alas. We liked the rolls we made with potato, but for dinner roll purposes decided we liked these much better. Some of our favorite hamburger buns are potato rolls, though, so we're still playing with the idea! Re the photos, that's black acrylic. I have a piece of black foamcore in the background, the rolls are placed on the black acrylic. You can do with with a mirror too, but sometimes get double reflections (you'll get a reflection both off the glass surface and off the mirror's silvering as well). Only downside to black acrylic is it does scratch, so you have to be careful, and it attracts dust like crazy! No matter how clean I think mine is, I always have to remove a few dust spots in post. Let me know if you need to know more, and thanks for taking time to comment (twice!). Hi Terra, homemade rolls are wonderful! These are so worth making -- such great flavor. ;-) Thanks for the comment. These look insanely good! Home made bread is something I am yet to attempt. Thank you for the inspiration! Hi Asmita, aren't these nice? Such terrific flavor, and fun to make. Thanks for the comment. Hi John, I love dinner rolls. Your look really soft and fluffy. Well done! Very spectacular pictures. Thanks for sharing the great information. Haven't had bread in a month. So this is killing me. I don't care if it's a roll or a bun - it's worth the carbs! Delicious! Hi Claudia, I've had way too many of these the last month or two as Mrs KR perfected her recipe! Batch after batch -- but I wasn't complaining! ;-) Thanks for the comment. John, I've tried these yesterday and........ they were amazing. Fluffy, buttery delicious everyone liked them. They are better than my parker rolls as they are less in calories. I was so skeptical at first as I thought 3 cups of flour were enough, then I decided to listen to you and added the fourth cup and got the feeling that it will not rise and will not be fluffy, but it turned out amazing. Thank you so much for this recipe definitely a keeper. Hi Amira, aren't these great? So glad you made and enjoyed them! And thanks so much for letting me know. Hi Amelia, aren't these great? And so, so good! Thanks for the comment. Kudos to Mrs. KitchenRiffs - these rolls look fabulous! Hi Shashi, don't these look great? And they taste even better! Thanks for the comment. Only had 4 tablespoons of butter left, so keeping my fingers crossed that they turn out. The dough is rising right now and looks ok. Will the reduced amount of butter make them too tough, as far as you know? Thanks! Hi Anonymous, they should be fine with 4 tablespoons of butter. In fact, Mrs KR has made them that way before, but prefers the flavor of 6 tablespoons. She says the texture is essentially the same. Glad you like the recipe and are making it. Let us know how you like the final result! Well, the verdict is in - they turned out great! I'm excited because I've never made rolls before. I cut the dough into 16 portions rather than 24 as I wanted larger buns for pulled pork sandwiches (I made pulled pork for the first time ever today as well!). Between the pulled pork and the rolls, I spent pretty much the entire day in the kitchen, but it was fun and rewarding. Thanks so much for the recipe. I've made your beer bread a couple of times in the past year, which was also the first time I made bread. Hi Anonymous, so glad you enjoyed these! Aren't they wonderful? Good idea to make them larger for pulled pork. You can basically make them any size you want (including hamburger or hot dog bun size). And isn't that beer bread wonderful? We've had that dozens of times, and never tire of it. Thanks so much for the feedback. Hi Malathi, I'll be sure to check out your blog. Thanks for the comment. They look delicious......I want some. Now. Hi Kitchen Butterfly, these are so good! And yes, you do need some. ;-) Thanks for the comment. It's funny how life is. I went to this cute pizzeria yesterday and they had similar rolls and I kept thinking I had to look for recipes whose result looked similar, because i couldn't have enough of those rolls with garlic butter. Thanks so much! Hi Alex, garlic butter is outstanding on these rolls! ;-) Thanks for the comment. Thanks for letting me in on the technique. How did you set up the lighting? I've fallen massively behind on my own blogging (living a life of too-much-work) but I DID save the link to this post because you had me at the title--drooling and dreaming of returns to the kitchen. Can't wait to have these lovely delectable roll (ha!) out of my own oven! Hi Deepa, life happens, doesn't it? ;-) These are totally worth making -- hope you enjoy! Thanks for the comment. Ohhhhh yum. These look INCREDIBLE. So buttery soft and golden, YUM! Hi Christine, aren't these nice? Loads of flavor, fabulous texture. ;-) Thanks for the comment.